a complete technical analysis and history of the 912 cars, from bumper to bumper. This book is up to date on all the latest parts, products and manufacturers that can help you with your project. 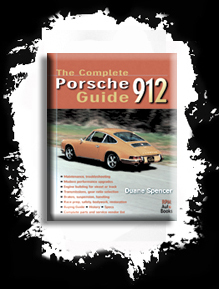 It is essentially a "How to do it" book to walk you though an engine rebuild, suspension and brake rebuild and update, and all other aspects of the 912 cars, be it coupe, coupe with sunroof, or Targa. The author will sign it if you desire for free! This is a must have book!